Photo view of Paris's Tuileries gardens and Place de la Concorde, east of the Louvre, Paris, ca. 1890s. In the distance can be seen the 1889 Eiffel Tower. This is a Swiss-process "Photochrom" image, colorized from black and white, for which the Detroit Publishing Co., as marked lower right in the image, had obtained exclusive rights in this country. The image is one of about eight hundred large-format study photographs apparently acquired in Europe/Paris and then brought back to Chicago, where they were mounted on linen and loosely bound by string in hard boards. Sizes vary. This print shows the character of the balusters, lighting, etc. at the east end of the Tuileries gardens at the Place de la Concorde. This suggest the future character of one of the first parts of Grant Park to be completed, in late 1910s, north of Monroe Street and to Randolph, and east of Michigan Ave. to the tracks. This was replaced in the early 2000s by Millennium Park, but Bennett's photographs elsewhere here of the new space 1918 - 1920 show the resemblance. 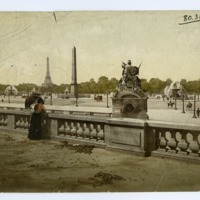 Detroit Publishing Co., “Jardin des Tuileries and Place de la Concorde (Paris, France),” Digital Collections - Lake Forest College, accessed April 26, 2019, http://collections.lakeforest.edu/items/show/2094.